Preheat oven to 200°C fan forced (220°C normal). Rub the pork all over with olive oil and salt. Then put it in a lightly oiled baking tray, skin side down. Rub a little more oil on top and cook in the oven for 30 mins. Turn the oven temp. down to 170°C fan forced (190°C normal) and cook in the oven for about 40 mins. Then turn the pork over and roast for about another 20 mins until the skin is crispy. Remove the pork from the oven, cover loosely with kitchen foil and rest for 30 mins, before slicing. Put the sugar, red wine vinegar and star anise in a small pot. Gently cook until the sugar has dissolved and the liquid is syrupy. Then add the stock with the orange zest and juice. Stir well and briefly cook until reduced. Season to taste. Heat a little vegie oil in a wok (or non-stick pan) and stir fry the bok choy. 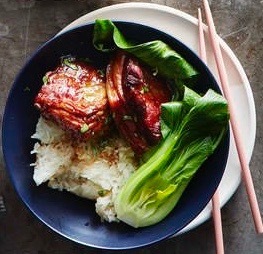 To serve, Plate steamed rice, arrange the bok choy and pork with the crackling on the side and drizzle the sauce over the top.